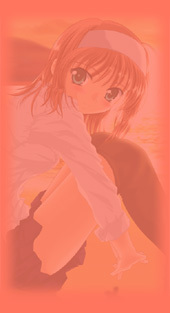 Since 8th February 2004, this web site proposes a collection of manga wallpapers. I hope that you will find your happiness there! For a best trip, go first to the Config page. Kawaii Screen has been converted to PHP. For you it's about the same, for me the following updates will be easier. お誕生日 おめでとう かわいい スクリーン ! Joyeux Anniversaire Kawaii Screen ! The beginning of a long series... Come back each week! I am proud to announce to you... 200.000 Hits!!! Plus a new page: Chobits, with 117 wp! And thank you for the counter: more than 50.000 Hits!!! (56.829 today... I had missed the day of 50.000). +1 skin in the config page: Misu Sâfâzu Paradaisu! Click here to select it directly. This skin is automatically chosen for new visitors who go in first in the Miss SurfersParadise's pages. Hey... now more than 4100 wp! Ja ne! More than 33.333 Hits!!! Thanks! And 3641 manga wallpapers on Kawaii Screen. +33 misc.! I wanted to put 60 of them but I didn't have the place on the server... So the 27 nexts in a few days (maybe 9/11?? lol). 30 wp are ready and will come soon in the other pages. An other BIG THANKS to Ignacio, for these new wallpapers. See you soon, have a good summer! Thanks to Free for this *free* hosting. Kagaya: very nice pictures (48), made with computer. And the page "Relativity of Horoscope" is renamed: now it's Zodiac, with 39 new wp! So +88 wp in this news... come back soon for the next! +125 wallpapers!! Now there is more than 3000 wallpapers on Kawaii Screen!!! Ai Yori Aoshi: 43 wp! And just for you, an other BIG news soon! (+200 ~ 300 wp ?) So... come back soon! A big news (more than 100 wp) coming soon! Ja ne! Thanks to eXagon for giving me 100 Mo for free! Already 1.000 Hits! Thank you!